Ernie Hammes studied classical music in Luxembourg as well as in France before he joined the Luxembourg Army Concert Band in 1987 to become their principal trumpet. In 1991 he started his jazz studies with Ack VAN ROOYEN at the Conservatory of THE HAGUE, (NL). In 1997, he went to New York City to study at the MANHATTAN SCHOOL OF MUSIC with Lew SOLOFF. Ernie recorded 5 cd’s under his own name and he can be heard as a sideman on over 35 recordings in various music genres. His first cd, “FESTIVAL”, recorded in 1997 , features classical trumpet works with organ and chamber orchestra. “STEPWISE”, released three years later, shows Ernies’ jazz skills together with his own group and guest musicians Lew SOLOFF and Bob MINTZER. Lew is also the producer of this album. The third cd, “NIGHT LIGHTS”, recorded live and also featuring his band, is released in February 2005. In December 2005, “TRUMPET CLASSICS”, a recording with trumpet, organ and brass quintet is released. You can also hear Ernie on the new Maynard FERGUSON album, “MF6, live at Ronnie’s”, released early 2006. He is also featured on the tribute to Maynard FERGUSON dvd together with trumpeters Eric MYASHIRO, Andrea TOFANELLI, Wayne BERGERON, Carl FISCHER and Roger INGRAM. “RETOUR A GOREE” , a documentary/musical dvd about jazz and slavery, released in june 2007, features Ern ie amongst African singer Youssou N’DOUR. In 2007, Ernie released the cd “FREED & FEIER” which includes a musical suite commissioned by the city of Luxembourg for the fireworks for the Luxembourg National day 2007. In July 2008, “ABOVE THE CLOUDS” , the new cd of the Amina FIGAROVA GROUP is coming out, a band that Ernie tours with throughout Europe, Canada and the USA . 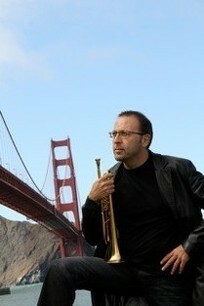 His latest cd “SANFRANCHA” is released in march 2011 and features his band “CUBOP” & many international guest artists. The original compositions are strongly latin-influenced. …appeared at the Blue Note and Birdland in New York, Ronnie Scott’s Club/London, Basement/Sydney, as well as during the Jazzfestivals in Newport, Chicago, Montreux, New Orleans, Portland, North Sea Jazz , Pori, Umbria, Vancouver, Edmonton, Calgary, Toronto, at the Royal Albert Hall in London and Concertgebouw , Amsterdam. Also in 1997, Ernie received the “DOWNBEAT Student Music Award” for jazz ensemble and big band, while studying at the MANHATTAN SCHOOL OF MUSIC with Lew SOLOFF. In 2008 nominee for the Eruodjango awards in the category “Masters of Jazz”. “…Trumpeter Ernie Hammes is an exceptional artist! His in-depth knowledge of jazz, latin music, baroque and symphonic music, puts him in a very special category. We have known each other for a number of years, and I always see a continuous development and growth of his artistry.